Where did the unquenchable hunger for Tamiya go? Is death near? Have you guys experienced this weird serene lull? Summer's coming, i just jump into boats, like anything you do for awhile............................ you can eat only so much spaghetti or PB&J sandwich's, time for new flavors. dang speedy_w_beans has me wanting to build an F1 now then back to pulling weeds HA! I think I'm past any buying frenzy now. It may be time to put some kits and finished models up for sale, and branch off in a new direction. I'll always be in the hobby, but paring back the collection wouldn't hurt. I have only been into it really since 2016 so I'm still going strong but I definitely got into that place with photography, had half a dozen cameras and a plethora of old school manual lenses that I used with modern cameras via adaptors. That was my main passion for over a decade but RC got in the way a bit so the collection got thinned out quite a lot, only two cameras and mostly just my modern autofocus lenses left. This year I'm hoping to combine the hobbies a bit more, there's plenty of places that suit bashing and photography such as the beach plus I can take photos of the RC stuff too. I'm sure at some point I will ease off on the RC and become more photography orientated again or maybe something else entirely but I think those two will be with me for life now even if they vary in intensity over the years. There are very few models left that I'd like to collect. The ones mainly from the mid 80-s to 1990-ish. I'm working on the Avante, but the Bruiser and maybe two more are the only Tamiyas in reach. Then an RC10 and Bolink Eliminator and that's it. Fin. I like being married. I’m sort of the opposite just now. I took a break from RC, and this forum in mid 2015 for various personal reasons. I made a snap decision to start posting again after reading @JennyMo‘s Tow Mater / Tam ‘ata’ thread and i’ve gone a bit mad with my purchases. I’m not feeling like i did before but i am now starting to have the urge to finish at least half of what i have sitting before i but any more. ETA: @nowinaminute love that photo btw! I just picked up a couple kits and I am starting to feel done for a little while myself. I have a Mountain Rider on order and maybe another Novafox but other than that there really isn't much else I would want. It's a good feeling as I have bought way too many kits in the last 18 months or so. It will be good to take a break from spending. I have thought of selling some items but have been burnt too much in the past selling and then regretting, then re-buying at a loss that I will be very careful with that course of action. Are your hobbies cyclical? If so, it will return. Since Tamiya is my main interest, its always there, at the front, no matter if I'm discouraged by MAP pricing or a re-release I didn't care for or other such thing. I come to the forum every day. Tamiya is a special interest for me. That said, my art, photography, writing, guitar work, etc. come and go in a cyclical fashion. No need to worry. It will return. Now, if you have negative feelings attached to it like my old car hobby, then it might be stone cold dead. I'm sure that's not the case for you. After not feeling a huge buzz with my Super Astute, I stopped buying new kits for awhile. Now, I'm busying myself with what I have which is cheaper . Trust me, most folks find it bizarre that I constantly (like everyday, every hour) focus on Tamiya (well, vintage RC, in general) because a normal person doesn't keep up that constant drive. Most everyone takes a break from time to time. I’ve been up and down in this hobby. From 1996 to 2008 I was hot and heavy into. Tons of buying and selling and restoring. In 2008 my ex asked for a divorce and logged my collection as a martial asset. This precluded me from selling anything to help with my legal fees. I was so disgusted that I didn’t even go into my garage for over a year. Once I settled on the property portion and gave her my real car so that I may keep my toy cars, I resumed the hobby. I’ve been in a relationship for 8 years now but not married so I don’t have to answer to anyone if I want to buy something. This is good and bad. I’ve bought more bicycles and motorcycles than you can shake a stick at. I know I have way too many R/C vehicles so I have to be choosy on what I buy. My son has got me into the crawler scene so I’ve been buying trucks lately. It’s something we can do together as adults and that’s more fun than anything else. I think every hobby waxes and wains. I was new to RC a couple of years ago so my initial burst was researching and learning about all the cars and model lines, picking up different models. That has definitely settled down now. With RC I am buying a lot of parts right now to finish some winter projects, but have only bought 1 kit in the last year. Don't force it. Just do something else or enjoy what you have. Actually that is kinda where I am now. I hang my nose over new kits and projects, but then I realise I haven't run my DT03 for months and Ultra G has just sat there since the last track day, and half the other cars are in bits being fixed or upgraded. I actually don't want more cars. It means more fixing stuff! Maybe try and get out running the cars you have a little more? Nothing like enjoying the cars you have to make you happy that you don't need anything else. My other main thing is mountain biking. I have been it for over 30 years and even though I have breaks or quiet periods, it's always there. Yup, but I am satisfied too. Now when I am back on my legs again I sold about 5-6 of them and bought 1 new car. I am overwhelmed with what I have to do now with my rc cars and as @ThunderDragonCy said... enjoying cars that I have. 1xM03, hollow carbon shafts, speed gears, 05RA uprights.. this M03 has a lot of upgrades, you name I have it, yesterday for it arrived a silver chassis and reinforced diff case with rear 2deg 05RA aluminium upright adapters.. more to come. 1xXray T1FK05 I want to take racing, need to shorten all servo wires and motor wires to a acceptable lenght. and buy a gear diff for it. also recieved a new body for it. And this together with my quadcopter I have not build yet is plenty then enough for me to keep me satisfied. I sold also my very first rc car a few days ago, a DT01 from 1998. Was really hard but it just sat on the shelf. I'm sort of in a similar place as my life changes. Just this week we had to change our budgets and that means my monthly 'hobby' allowance fund is now much stricter - it hasn't gone down, but if I go over it's a bigger problem for us. That doesn't just cover RC parts and cars but event entry fees, event food and drink, fuel to get there (if my current fuel budget doesn't cover it), plus any non-RC stuff I want, like alcohol for weekends, going to the pub with mates, clothes and shoes, music equipment, computer games and software... There's still enough to have fun, rising fuel costs mean I might have to stop doing some of the events I'd been planning and start working to organise more closer to home. Also up until last week I could claim a lot of mileage expenses for work, which usually paid enough to cover fuel for RC events on the other side of the country. My employer has lost that contract, so no more big mileage expenses for me, so maybe my 8-hour round trip to the Tamiya Junkies meet last month was the first and last, depending what my next contract brings. I'm not losing the love for the hobby but I'm definitely losing the space - my personal storage area in the garage loft is now 90% RC stuff and almost unworkable. It's hard to get to anything. On top of my 1:10 cars, buggies and trucks I now have 5 1:14 tractor trucks and 4 trailers and they take up heaps of space. My studio was downsized a year ago and is now a shared space (previously it was mine, all mine, mwuhahaha!) so I have far less cars on the shelf at any one time. With less money to blow on RC, I make more of my own parts. That takes longer, so projects that I might have hoped to start this year probably won't see light for 2 or 3 more years yet. Having to wait longer between parts orders means things sit on the bench for longer. In short, projects are taking longer. But - here's the important but - they have more value to me. So yeah, I'm kinda satisfied with what I have. I love the new Quattro shell but I have enough shelfers and nobody is running rally cars near me, so I might pass it by. My D4-CS isn't inspiring me on the drift circuit, I really want an MST RWD chassis, but I can't afford it just yet. In the old days I'd have bought the MST and kept the D4 as a backup or a shelfer, but actually I have no love for it, so may end up on ebay along with the NIB D4-RWD. In the mean time I have more than enough projects to keep me going for a good few years and more than enough runners for when I have the money to get out to bashes. When the summer is coming and it is finally nice weather to run the cars, I often tend to loose interest, and then when the weather gets bad again, I gain interest in buying, building and so on. This year I will be racing for the first time, so the interest is higher than usual. I convinced the wife it's for my eldest daughter but we all know who's it really for. I'm... trying hard to be satisfied with what I have. Let's put it that way. There are things I want to buy, and there are things I already have that I have lost interest in, but I absolutely hate the process of trying to sell stuff, so I'm just sitting on it for now and waiting to see if inspiration strikes. And my hobby budget is essentially zero right now, which forces me to make do with what I have. And really, I have plenty of projects and ideas for projects. Most of them don't require any further outlay of cash, apart from maybe paint or something. What I'm lacking now is the time required to gain the skill I need to build the things I want. I've jumped into the world of scratch-building with both feet, and I have acquired quite a pile of failed/abandoned builds. I start on something, and then get frustrated because it isn't turning out right, or I have to stop and go do some real-life thing or other, and by the time I get back to the build, I've lost interest and start on something else instead. So this year's goal is to slow down, concentrate on what I have and what I'm doing, and get good at scratch-building. I have no interest in the whole 3D printing thing; I spend all day long designing things on a computer; when I go home I want to work with my hands, not mess around with CAD files. My builds will be hand-made, and I just have to get OK with the idea that things will be a little rough. And I need to force myself to finish builds regardless of how they're going. Quantity, not quality, and allow myself to gain skill with each new build. So while my spending has dropped off to nothing, my activity in the hobby is accelerating. And I guess that's as it should be. I have a 69 BSA Lightening in my garage that poured a solid two years a lot of $$$ into tearing down building it back up, from the crank. I haven't touched it in two years. I just got burned out. It happens. I'm not going to sell it because I know I'll regret it when the time comes and I want to get back and finish it. Same thing with any hobby, sometimes you just need a break, but if you're like me, that spark will return again in time. 4 years in after 35 out and I’m pretty much satisfied I’ve nailed the reason I came back. I wanted to own every Tamiya kit I drooled over from 78 to 83 but couldn’t afford as a kid - all with the original boxes + manuals I’d have poured over at the time. Thats 99% done - and lightly extended to complete a vintage 3 speed set with the original Bruiser / Mountaineer. The thing is - I’m now battling with myself about delving a bit deeper into same period vintage kits that I now think are awesome ... but didn’t at the time. Come on guys, RC is like bread and butter! lol... Having enough today doesn't mean that I'm never eating again. (don't kill me off yet, please... I like staying alive) Reading my post again, I guess it was ambiguous. To be fair, soon after I stopped buying back in 2004, I did get into other hobbies. (Juggernaut-1 was a dud, and Terra Crusher was quite sluggish) But when I came back, I was lost and found, I was hungry like the wolf. Now that I've hunted down a dozen, I'm thinking, "what's the hurry? I should take time and eat all this." These projects will occupy me for years. That's a great feeling. Only the desire to get another RC car has gone down. I wonder if it's because I'm on ketosis now? Every spring and fall, I was tired. I feel good this spring. Or maybe it's the pu-erh tea I discovered recently (I've never had fully fermented tea before!). More energy means less desire to buy? I don't know. At any rate, I can't wait to take apart TL01B and put ball bearings in. (I already took off 1 shield each for bearings that will go into the gears) I need to put in a reinforced belt for DB01, and paint several shells, etc, etc. It's just totally strange how I don't want to buy another car. But I'm more excited about tackling the projects. I think that's a healthy development. Can you tell me more about this? I already place simple metal shielded bearings in transmissions and use rubber sealed where exposed to the elements. Is removing the shields simply taking this practice one step further? Yes. But I don't recommend going this far. Too much hassle for too little return (unless you've got 70+ bearings like Dynahead). 2) Since there is far less gap, I thought rubber shields would offer a lot more resistance, but no. After washing the grease off (no oil yet), I rolled it in my finger. With 1 shield in place, it rolled for 2 full seconds. That's almost as good as full-monty bearings. From these, I decided to have 1 side shield bearings for the gears. Each gear needs 2 bearings. 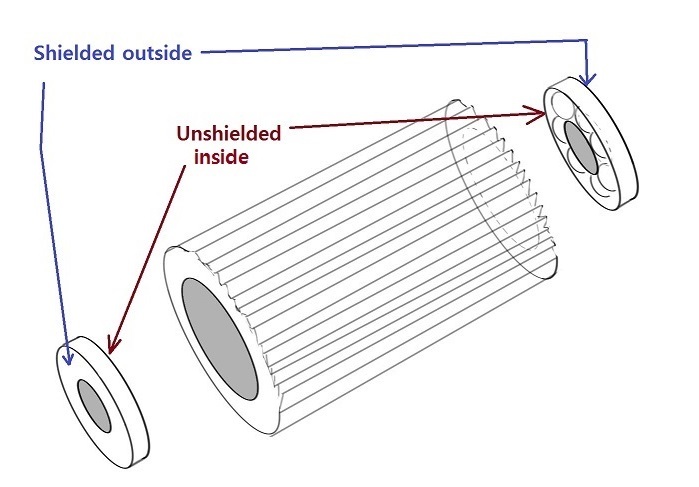 2 shields on the outside could encapsulate the gear. I don't think dirt would spontaneously grow within the gear. So I just left the shield off on the inside. Since the shields don't offer much resistance, I could just as easily put them back on. But some are bent in the process of taking them off. You can bend them back to shape, but it's just easier to leave one side off. 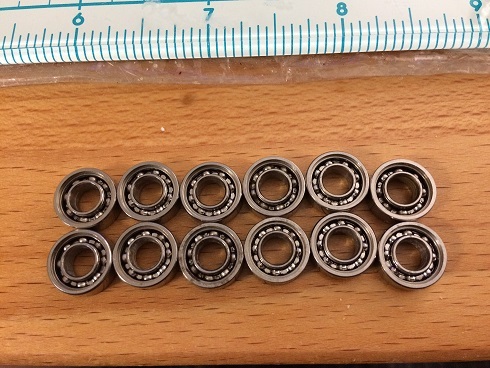 It's a lot of hassle, but without spending a dime, these can imitate ceramic bearings. Below have shields on the other side. Below is rubber sealed 1150 vs ceramic 1150. Another video-- I figured I'd just clean the grease instead of buying expensive ceramic bearings. I'm late to this party but its something I've been thinking about as well. Its not necessarily about Tamiya though, as 3 of my 5 racers aren't Tamiya, and I don't feel the need to upgrade those either. I definitely want more cars but just can't justify the expense and can't rationalise more cars that realistically won't make any difference. I would like some better runners for the backyard but its not worth $700 for a Super Astute and Top Force when I have better cars than those sitting in a box, and I'm fine with this. I even thought about a new 4wd buggy to racebut its not going to make any difference to me at all so I haven't done it. Its not about being over the hobby either as I am racing every second week and playing with my son in the backyard in between, its just about.......being satisfied, i guess. I think its the difference between being Passionate & Addicted @Juggular. When you have a passion for something you know when to stop and can, with addiction you can't it takes over your life. So being able to stop reflect and be content is a very noble attribute. I got really exited about the re-release of the Mountain Rider and thought wow I've got to get one of those. But the realisation of spending A$700-800 on one kit. Yeah nah, waaaay beyond my comfort zone. And I'm happy with that as I'm having a lot of fun with what I've got. I intentionally bought a Transmitter with a 10 model memory to help me keep a limit on it too. I have a varied growing fleet, to cater for different moods so once a couple more find their way in I will be just tinkering with what I have as I take just as much pleasure in seeing them at home as running them. I had a concern for a friend of mine who was addicted to Brake Fluid, but he reassured me he could stop at anytime. I think it also may have something to do with why we buy them. There is the collection standpoint and that leads to a lot of cars. I wanted all the early 4wd buggies, vintage or re-re. That, right there, is six models added to the collection on a display shelf. I want runners since I love the chassis so much, so that's another two more on top of that since I have a mutt basher and standard Hot Shot I enjoy seeing in action. Normally though, I try to limit runners with only one or two of a particular chassis type. As much as I wanted a Manta Ray re-re, it was pointless since I had a Top Force re-re. There's the design/construction aspect to consider too. Models begin to accumulate because we thirst for new designs to assemble. A great deal of us, at our age, enjoy the build more nowadays. Seeing how different Tamiya's are put together is fun. I've done a billion Clod Busters so its unlikely I'll buy a new Super Clod for the fun of assembly (fingers crossed for an original Clod re-re though ). This is a good part of why I've slowed down. Apart from the Falcon series, I'm intimately familiar with all the first 100 off road designs to the point I could assemble some blindfolded (just watch that X-Acto knife, lol). Lastly here is the runner rabbit hole. This can be the most addictive and reckless. Perhaps, on some level, we are chasing that "high" we got as kids. We keep buying kit after kit, looking for the one that will give us that again. The fact is, my Lunch Box seemed fast and big (compared to the toy-grade stuff I had before) in the late 80's but never will today through my adult eyes. 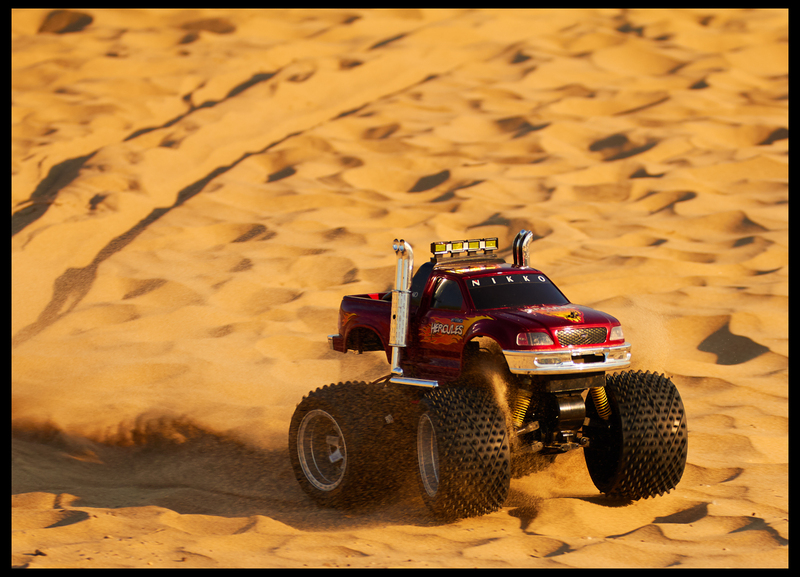 Some might simply go after the thrill aspect (at one time known as the Traxxas syndrome, though this is changing with things like the TRX-4). Other's see something and think it might be neat but are disappointed in the actual result. I envisioned the CC-01 as being great fun as many members love them. After two or three runs, I decided it wasn't for me. The lucky ones (or a least the ones with the least damaged bank accounts) understand these principles on some level early on and don't end up with 50+ cars. On the other hand, I think to myself, what else would I spend my money on? If it makes you happy and it doesn't hurt anyone, like the Super Champ says, Go For It!